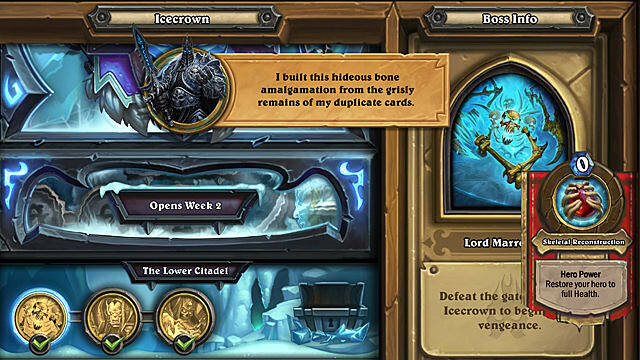 Alongside a whole arsenal of cards in the Knights of the Frozen Throne expansion, hearthstone received a brand new adventure that comes completely free for all players. The adventure consists of three wings, each of which offers three boss battles. This week, the Prologue and the first wing of the Lower Citadel are open for everybody. 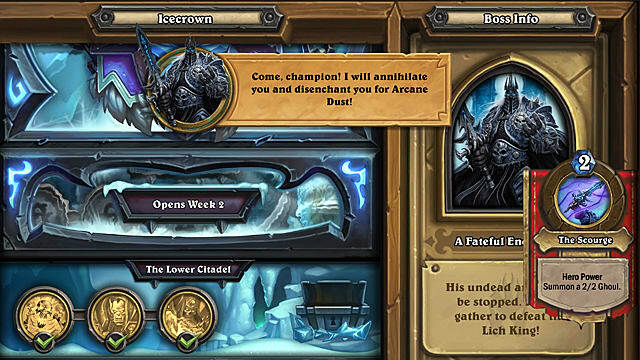 If you manage to beat all bosses, you will get a random Death Knight card and a pack of cards. If you want to know how to beat all the bosses of the first wing, keep reading this guide for all the information you'll need! 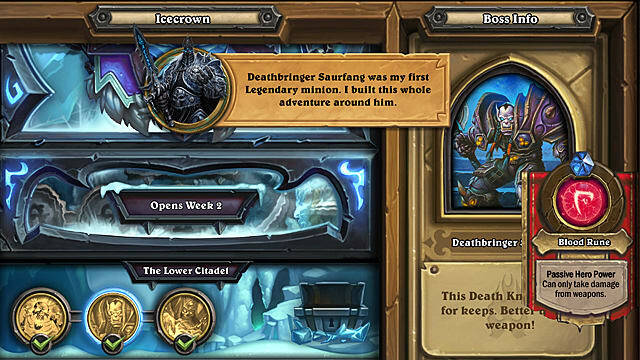 The first boss you will encounter in the Prologue is The Lich King himself. In this case you don't get to choose your deck, but you will be provided with the pre-constructed one. The match-up consists of two segments, the first of which you will lose no matter what. But don’t hit the Concede button yet. 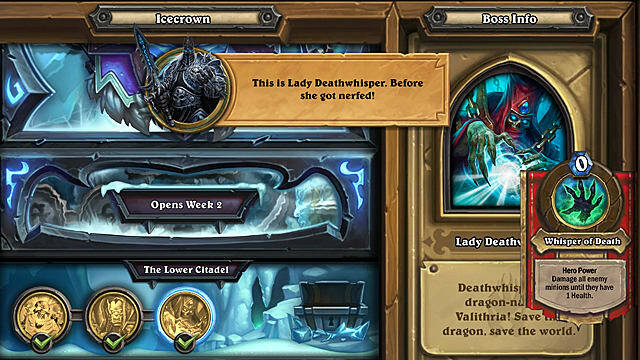 The Lich King will transform your hero into a Death Knight form, and in this case your vanilla Jaina will become Frost Lich Jaina. In the second part of the match-up you will face Tirion and his army of horrible minions. This battle will be extremely easy to win -- just play on curve and you will get there soon. In the end you will be rewarded with a random free Death Knight hero card. The first boss of the Lower Citadel is Lord Marrowgar, who has a neat hero power that heals him to full health each turn. This means that you can’t kill him gradually, but you must come up with an OTK (one-turn kill) combo deck. First, use Thoughsteal to copy Lord Marrowgar’s Bone Spike minions that deal 15 points of damage to the enemy hero. Then, use Divine Spirit to double the minion’s health, and Inner Fire to make its attack equal to its health. In this way you will finish Marrowgar in one turn. The Priest deck is a budget variant of the OTK deck. But if you have enough dust, you can craft the massive Jade Druid deck that will let you create an army of huge minions in one turn. In this way you can have over 30 damage on board and easily finish Marrowgar. Deathbringer Saurfang has a peculiar passive ability that protects him from any type of damage except one -- the damage from the weapons. As you know, the class with the largest number of weapons in hearthstone is Warrior -- so this is the best hero you can choose to play against Saurfang. Your deck must consist of all the available Warrior weapons, excluding Fool’s Bane that can’t deal damage to heroes. Also, consider minions and spells that buff your weapons, such as Upgrade!, Heroic Strike, Bloodsail Cultist, Naga Corsair, Spiteful Smith, and others. The final boss is quite tricky and will be hard to beat, if your deck will not be able to effectively heal its minions. The problem is that Lady Deathwhisper’s hero power sets the health of all enemy minions to 1, which makes them extremely vulnerable. At the same she has 30 health and 90 armor that requires 120 points of damage in total to kill her. Sounds challenging, isn’t it? But don't worry, you will have a helping hand in this fight. There is another minion on board at your side -- Valithria Deathspeaker, a dragon with 30 attack and 5 health. Unfortunately, this powerful dragon can’t attack unless it is fully healed. If you remember Lady Deathwhisper constantly deals damage to all enemy minions, so you need to find a way to heal Valithria each turn for it to be able to attack for 30 damage. With the help of these moderately budgeted decks you will be able to finish all the wings of the Lower Citadel, earn a legendary hero, and a free Knights of the Frozen Throne pack. Come back soon for more hearthstone guides at GameSkinny!